Clean burning propane propels our specialized skid steer loader in remote locations where low emissions are required. The propane powered skid steer loader is a modified version of the diesel powered unit. The diesel engine was replaced by a gasoline engine and the fuel system was removed. A new propane fuel system was installed, electrical system modified, and cooling system relocated. The extreme flexibility of this machine allows it to be operated in almost any environment. This is especially useful in situations where low emissions are required but the remote location of the work area would prevent the use of an electrically powered equivalent. This self sufficient loader has the ability to work indoors or out, without the need for an external power source. 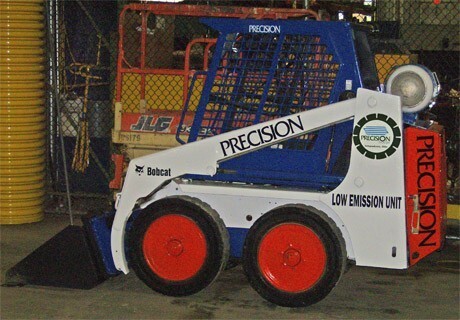 The ability to run any standard skid steer attachment along with the low emissions output make the propane powered unit an excellent choice for projects such as above and below ground parking decks, indoor warehouse areas, or any place where ventilation is limited. Our Propane Powered Skid Steer Loader is one of many modified pieces of equipment that our experienced Precision ProCut personnel utilize when servicing our customers. While we do not rent out this piece of equipment, if you would like further information about this service please contact our Sales & Estimating Department.